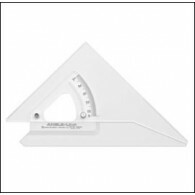 Professional quality triangular Verulam scale rule Manufactured to the highest standard under controlled conditions Exceptional clarity and legibility Unequalled accuracy and design Material is chosen for its toughness and stability 12" Fractional Dividings: 3/32”, 3/16” =..
Professional quality triangular Verulam scale rule Manufactured to the highest standard under controlled conditions Exceptional clarity and legibility Unequalled accuracy and design Material is chosen for its toughness and stability 300mm Dividings: 1:1 x 1:2, 1:5 x 1:10,&.. 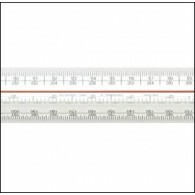 Metric 'A' trianglular Academy scale rule Accurate and clear Quality, cost effective material Colour co-ordinated scales in ten dividings Ideal for educational purposes 300mm Dividings: 1:1, 1:10x1:2, 1:20, 1:5, 1:50x1:100, 1:200, 1:500, 1:..
Professional quality triangular Verulam scale rule Manufactured to the highest standard under controlled conditions Exceptional clarity and legibility Unequalled accuracy and design Material is chosen for its toughness and stability 300mm Dividings:&..
Professional quality triangular Verulam scale rule Manufactured to the highest standard under controlled conditions Exceptional clarity and legibility Unequalled accuracy and design Material is chosen for its toughness and stability 300mm Dividings: 1:2.5 x 1:5, 10 x .. 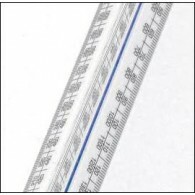 Architect's Trianglular Academy scale rule Accurate and clear Quality, cost effective material Colour co-ordinated scales in ten dividings Ideal for educational purposes 12" (300mm) Dividings: 1:20x1:25, 1:50x1:75, 1:100x1:125..